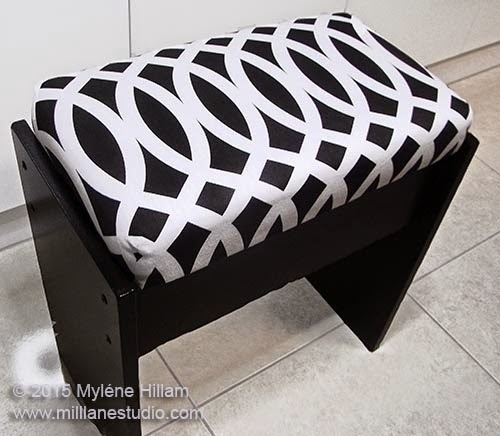 Today, I continue the transformation of my little sewing stool from dated 1980's brown laminate to a modern, graphic piece of furniture that looks right at home in my recently revamped studio. Didn't it come up well?!! You can see Part 1 of the transformation here. What I started out with is the little stool below. 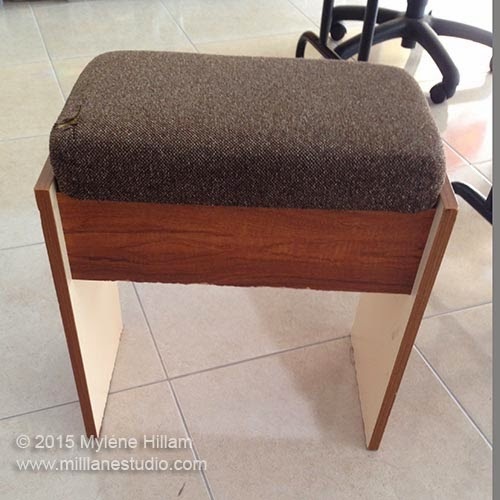 It has served me well over the years; firstly as a sewing stool and more recently, as seating in my studio. 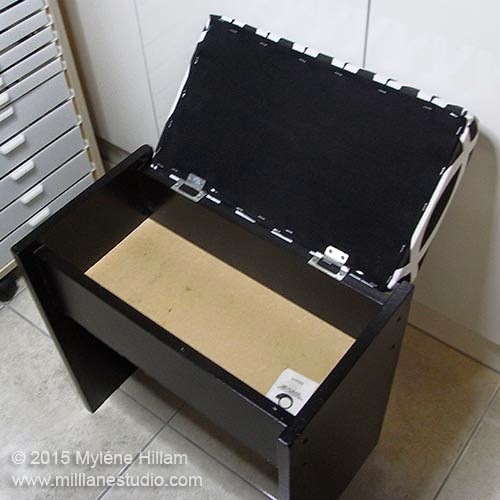 It has a lift up lid with storage inside making it perfect for stowing away works in progress when I have to clean up the studio for workshops. But this dated brown laminate just has to go! Replacing the laminate isn't an option because the composite wood underneath would probably have disintegrated if I tried to remove the old laminate. 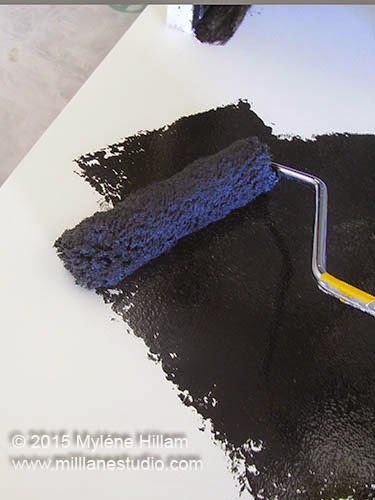 The best alternative is to paint the surface with laminate paint. So off to the hardware store I went armed with a list of what I needed. But my jaw nearly dropped when I saw how expensive the laminate paint system is: Tile and Laminate Cleaner - $14, a 500ml tin of White Knight Tile and Laminate Primer - $36; and a 1 litre tin of laminate paint - $51...... way more than I had budgeted for this project. So I have a dilemma! Should I abandon the project because of the cost? After all, I have only invested $6 on fabric so far. Or should I continue because of the senimental value the stool has for me? After weighing up the pros and cons of continuing with the project, I decided it is worth splurging on the White Knight laminate paint system. 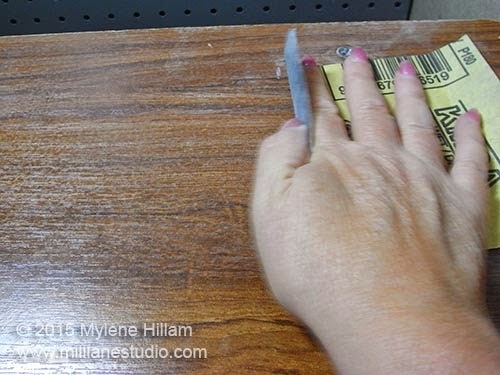 So, armed with the products I needed, it's time to make that brown laminate disappear! 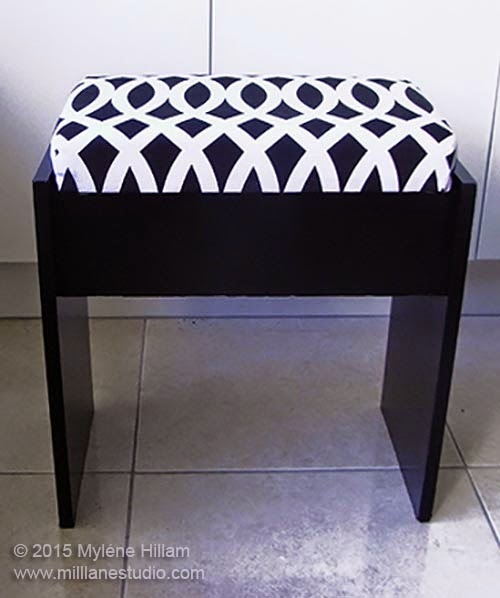 Read on to see how my stool was transformed. 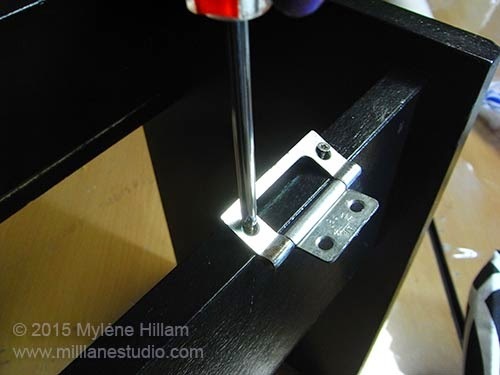 Before I got underway, I tried to remove the screws to disassemble the stool but they were so tight that I couldn't budge them. I figured it wasn't really a big drama to paint it whilst it was still assembled but it would certainly have been easier to paint if it had been disassembled. I started out by lightly sanding all the laminate with 240 grit sandpaper to give the surface some tooth. It's surprising how much dust that produced so I gave it a good wipe down before proceeding. I applied a layer of Tile and Laminate Primer to the roughed up surface with a microfibre roller and allowed it to dry for a few hours. It seemed a little patchy so I gave it a light sand with 240 grit sandpaper and followed that with another coat to make sure I had a good base to work on. After sanding the primer again, I applied the black laminate paint in a cross hatch pattern to make sure it completely covered the primer. And then I smooth-rolled it all in one direction for an even finish. 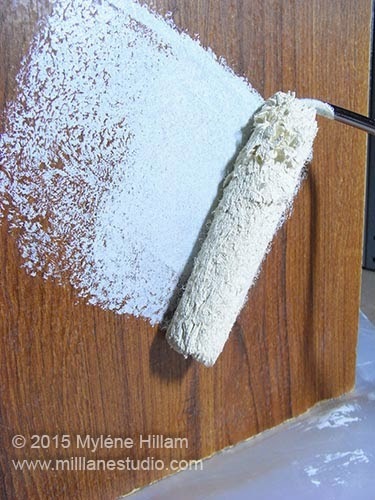 The first coat was touch dry after only two hours but it needed to dry for six hours before sanding with 600 grit sandpaper. Then it was ready for its second coat. .... and the other to the lid. And voilà! My fabulously modern stool looks wonderful. 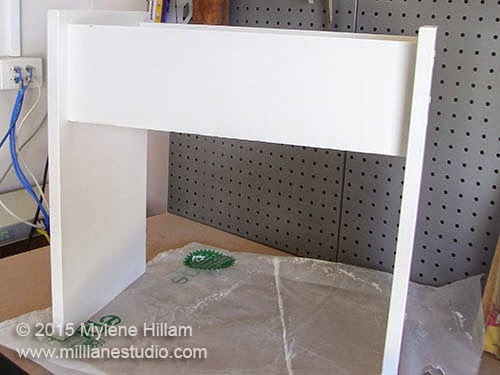 I'm absolutely thrilled with the result and now the stool looks right at home in my clean, crisp black and white studio. The makeover was worth every cent!